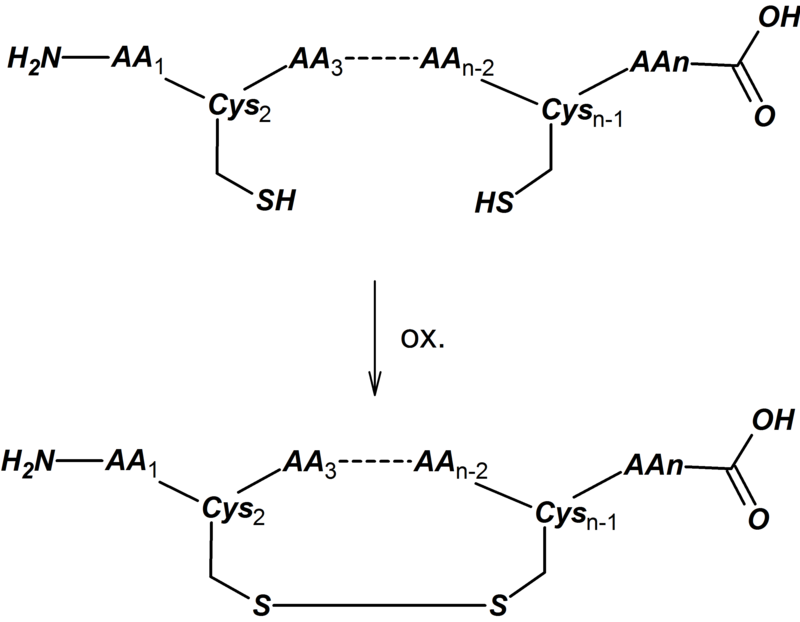 Cys-Cys cyclization is the result from formation of a disulfide (S-S) bond between the thiol side chains of two cysteine residues in a peptide. Synthetically, this is the most frequently used peptide cyclization method. The main problem to be prevented is that of dimerization, but this can be minimized by performing the cyclization under ‘high dilution’ conditions. 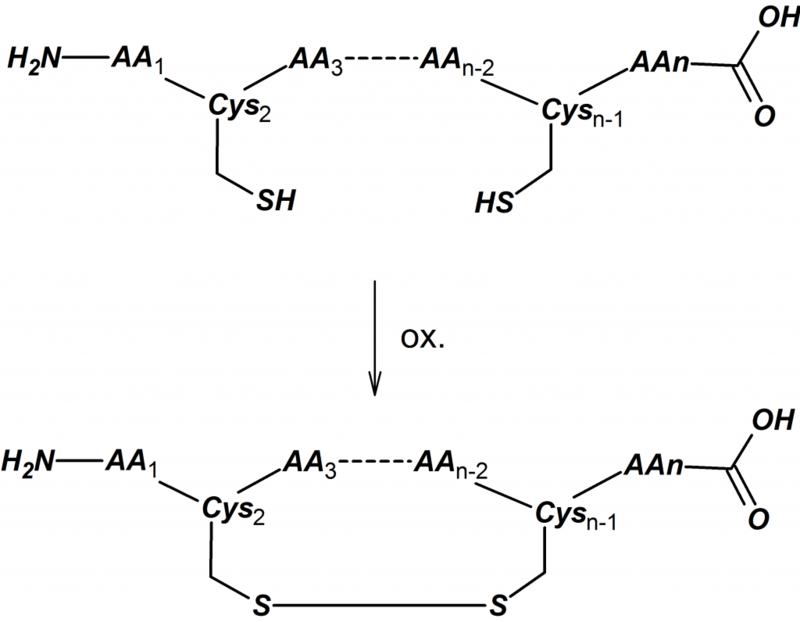 However, a distinct disadvantage of Cys-Cys cyclized peptides is the limited stability of the SS bond, especially under reductive conditions. Amide bond cyclization is frequently used for cyclic peptides. It has the advantage over disulfides that these are chemically more stable. Most often backbone-amide cyclized peptides are prepared via head-to-tail cyclization or side-chain-to-side-chain cyclization. Similar to Cys-Cys cyclization, some synthetic challenges are encountered with amide cyclizations. An important challenge with head-to-tail cyclizations is the fact that the peptide cyclization is often slow due to entropic reasons. This can lead to undesired side reactions like racemization or peptide capping by coupling reagents. Effective head-to-tail cyclization therefore requires thorough expertise with respect to the optimal cyclization reagent and cyclization conditions. Over the years Pepscan has developed deep experience and know-how regarding the synthesis strategies for amide cyclic peptides, resulting in very high success rates even for challenging peptides.